We in the West tend to be self righteous. I too, share the feeling that our culture is superior, but we forget we have evolved and are still evolving. Christians didn't start out by conquering barbarians, but at different stages Christian swords threatened the heathens and political decisions were made backed by military might that helped Christians to dominate the world. But we were not unified or always peaceful towards one another. Rome seized power, but really persecuted Christians in the beginning. Before it was overwhelmed by Muslims, Constantinople was another power centre. The Coptic church developed in Egypt. Over time various ethnic variations built churches. Can one forget the Crusades where millions were killed? Most of us are conscious of Catholic Protestant conflicts that still have impact. The Baptist movement stirred up repression. The Spanish Inquisition is something we would like to forget while there were other religious persecutions of particular heresies by other authoritarian factions. Today religious factions impact politics where some groups feel the rest of their country is going down the wrong road and need to have our behaviour dictated by religious guidelines. One large cult believes the Holy Land must be controlled by Jews in order for the Second Coming to occur. When the West suffered what is recalled as the Dark Ages, the Muslims were reaching the peak of their influence. For the most part they had little to do with the downfall of the West, but ironically were instrumental in helping us to the Renaissance. They were the ones who copied and translated the wisdom of the Greeks, the Romans and others so we could once again discover our heritage. They had a tremendous respect for education, science and medicine. We use an Arabic numbering system that includes the concept of zero amongst many other scientific developments. They lapsed into colonies of the West and into dictatorial enclaves. We took advantage, especially after oil was discovered. We used them to help us win our wars and made a few promises along the way. We ignored natural boundaries and imposed our own to suit our politics. We even deposed an elected national leader (Iran) and imposed a dictatorial monarch that supported the setup of an oppressive secret police. The situation in Saudi Arabia is very delicate with a very strict form of Islam called Wahhabism that has tremendous influence in that country and very far beyond. All that many in the West know of Islam is that it is violent. Some like to point out that there is a great deal of violence in the Qu'ran, but a similar effort could uncover a great deal of violence in the Bible as well. Islam continues to gain converts at a rate that mystifies Westerners. Some people find peace and equality in the faith. Many Christians feel their religion is their ultimate guide to morality just as many Muslims feel their faith is tied to their behaviour. In the West most nations have a adopted a separation between church and state, although churches do influence our societies. Many Muslims feel church and state should be intertwined, although they have a long history of tolerance for other faiths. It is hard to catalogue all the decisions we imposed on the Mid East (and the rest of the world). We were content to let friendly dictators keep their subjects ignorant and compliant. In reality some dictators kept control by repressing some religious or ethnic groups. When finally some of the dictators were overthrown some of the ethnic groups rebelled. Many of them felt that we in the West were complicit in repressing them. They felt that their dictators were manipulated by the West on one hand, but also manipulated the West to maintain power. Most main stream media gives us an Israeli perspective on the Palestine question and we cannot understand what is wrong with the Palestinians. They appear to be backward and are always trying to kill Jews. We are seldom given more than a hint of the outrage Muslims feel about the injustices inflicted on the Palestinians and the occupation of their land. A significant amount of the outrage of inhabitants of many Middle Eastern countries is due to the perceived injustices doled out by Israelis, Americans and Europeans. What benefits everyone is open information and respect for one another. As a global village we are amazingly ignorant about one another. We are all born into a culture that gives us a perspective. It is perfectly natural to think we are superior, have always been and always will be. Others are backward, unfortunate and not to be trusted. Underneath all that we are very similar--we fear, we love, we hate, we are jealous, we want more (of different things) We seek pleasure and avoid pain. We work and struggle to be better than our peers. Very often we want to impose our viewpoints on others. Whenever we favor one group for our political advantage we offend some other group. Just as in our past one Christian sect wanted to kill another Christian sect it seems there are Muslim sects ready to kill other Muslim sects and apostates over different interpretations of text and history. In Iraq essentially we replaced a Sunni minority dictator with a Shiite authority in many ways seeking to avenge previous imbalances. In Syria an Alawite minority has imposed its will on different factions and they are fighting back. Turkey has its own history and a big concern with minority Kurds that also are prominent in Iraq and Syria. Iran feels threatened by ISIL, but at the same time wants to keep Syria intact as an ally. As in America there are very self righteous religious factions that feel they need to reform/replace the current power structure. It is very complicated and it seems that little progress is being made. Not fair to say there are not elements of sanity where we can encourage progress, but it seems discouraging. The solution to the problems of the Middle East is not to kill everyone, but to persuade them that tolerance and understanding and respect work better. In reality we all share common problems. An obvious one is climate change which has complicated everything else including the Middle East itself. More than that we need to have a world economy that offers dignity to everyone. Where everyone feels they have a role to play. There are groups of Jews and Arabs, both in the Mid East and around the globe trying to understand one another and work for mutual betterment. Perhaps Shiites and Sunnis are working together and if so we need to encourage them. Governments have the power to encourage tolerance, but in reality there is political risk in doing so. Each of us needs to understand our own tolerance level and expand it. Here in Canada we used to be considered neutral and have helped negotiate peace, but not so much anymore. A really good source of information on the Middle East is Juan Cole who blogs regularly at http://www.juancole.com/ Juan speaks a few Middle Eastern languages and has hands on experience. He also has made an intelligent effort to understand. We would all benefit if he was paid more attention. Here in English speaking Canada we are not very conscious that the rest of the world has a positive view of our country in part because of Quebec's French Canadian film makers. In 2004, "The Barbarian Invasions" won the Oscar for best foreign language film. Over the years a number of Quebec films have made the final cut for foreign language Oscar nominations: "Jesus of Montreal" "The Decline of the American Empire" "Incendies"," Monsieur Lahzar" and most recently, "War Witch." Because of Quebec sensitivities about being a language minority they have fought in various ways to protect their heritage. The future is in the hands of our youth and Quebeckers realized that movies get the attention of the young. If they can be pulled away from the Hollywood onslaught there is some hope the language and culture will be respected. "Mon Oncle Antoine" in 1971 is considered a Canadian masterpiece. It was considered Claude Jutra's best film. He had gotten off to an early start in Canada (after completing medical studies), but then went to France where he worked with Francois Truffaut and Jean Rouch. Another movie of his, "Kamourouska" featured Genevieve Bujold, a Quebec actress that went onto Hollywood success. Denys's brother Gabriel has been a stalwart actor in Quebec. Recently enjoyed his performance in "The Auction" and "Congorama" Earlier he had played in Quebec favorite, "Les Plouffe." Denis Villeneuve director/writer, in 2000 brought up "Maelstrom" and won a lot of recognition in Canada and for Marie-Josée Cruze. Another award winner "Polytechnique"came out in 2009 depicting a tragic anti-female incident. 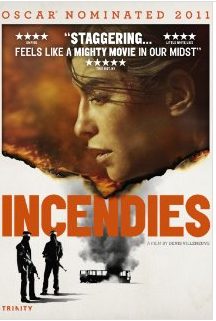 "Incendies" broke new ground in 2010. I had been warned about the underlying surprise, but it still is very shocking once you get inside the head of the two protagonists and watch them uncover layers of confusion and hate. One of the most powerful films I have ever seen and I did feel it was the best film I saw that year. It was nominated for a the best foreign film at the Oscars. Since then Denis has been recognized by Hollywood and has directed, "Prisoners" and "Enemy"both with Jake Gyllenhaal with more getting set for release. Philip Falardeau in 1993 won a tv contest that required him to travel and take 20 shorts. From there he worked for the National Film Board and made two documentaries that gained national attention. His first feature was "La Moetie gauche, du frig" gained international attention. In 2006 he set up a Canada, Belgium and France co-production for "Congorama." In 2008 the came up with another winner, "Cest pas moi je le jure." In Philippe adapted a stage play, "Monsieur Lazhar" that was nominated for best foreign film in the Oscars. This was a movie that the non Hollywood ending caught me off guard. His latest film "The Good Lie" with Reese Witherspoon is his first Hollywood effort. From "Monsieur Lazhar" another Canadian, young Sophie Nelisse who won an award for the film has gone on to play the lead in "The Book Thief"
Stephane Lafleur who edited "Monsieur Lazhar" was the director/writer for "The Auction" and recently released "Tu dors Nicole" that is making a good impression on the festival circuit. Ken Scott, started as a writer and actor including "La Grande Seduction" (a.k.a. The Seduction of Dr Lewis") later he re wrote in English as "The Grand Seduction." He wrote the script for one of Quebec's greatest heroes, "The Rocket," Maurice Richard. He wrote and directed "Starbuck" and then got to write the English version, "Deliveryman" starring Vincent Vaughn. Jean-Marc Vallée is still another Quebecker who was grabbed by Hollywood. A really different movie, "C.R.A.Z.Y." got early attention and he also did "Cafe de Flore" with French actress Vanessa Paradis. He directed Emily Blunt as "The Young Victoria." He directed two actors to Oscar acting nominations in "Dallas Buyers club." "Gabrielle," directed by Louise Archambault portrays the problem of a mentally challenged young woman wanting to be independent. It was the Canadian nomination for the Oscar best foreign language film, but didn't make the cut to the short list. "War Witch" (a.k.a. "(Rebelle") directed and written by Kim Nguyen, set in Africa was on the short list for best foreign language film at the Oscars. Xavier Dolan is an up and comer who has written, directed and acted in award winning movies and is now moving into English films. 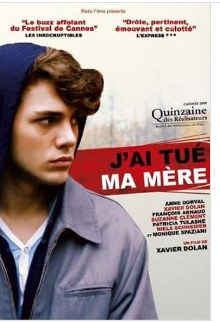 Made his mark with "J'ai tue ma mere" ("I Killed My Mother") as director, writer, actor and costume designer. acted in Canada's foreign langage Oscar nomination for 2014--"Mommy" won the jury prize at Cannes Also noted for "Laurence Anyways". In 2014 acted in "Elephant Song." an English language film. Other notable films from Quebec include "Louis Cyr" another hero, but with a very human story to tell. Directed by Daniel Roby and starring Antoine Bertrand who had a supporting role in "Starbuck" Other Quebec movies I enjoyed were "Gerry" put on by the Art Gallery of Hamilton World Film Festival and "Bon Cop Bad cop" a bilingual action movie starring Patrick Huard and Colm Feore. As Canadians we should take pride in what our francophone brethren have contributed to national pride, but also help us understand them a little better. I was not able to view all of the movies listed, but put the ones I saw (and enjoyed) in bold letters. Will be investigating the others. 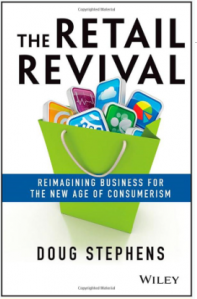 For people who fear change Doug Stephens paints a scary future for those who like to sell things and services. His hopeful title indicates he does see opportunities to prosper. First heard with Mary Ito on Fresh Air--a good source for ideas. The world has changed and is still in process. After the Depression it took the Baby Boom to really get the economy rolling. After the World II with all the returning soldiers there was fear there would be no jobs for them. There were other factors, but with the increase in babies being born there was also an increase in demand for goods and services. As Doug put it, most wanted to "keep up with the Jones" and advertisers had it easy if they had the money to use the three networks in the United States to reach most of the market. Demographics have certainly changed and so has technology. We live in a diversified population and with technological changes that were unforseen. Advertisers now have a lot more channels to use to reach their "targets," but it is more expensive and more challenging to identify your target. Automation and outsourcing are steadily shifting jobs. The middle class is being diminished taking away the consumers who have been driving the economy. Box stores replaced many smaller stores and all physical outlets are now competing against the inter-net. Retail staff is treated poorly resulting in turnover and bad service. Doug projects that in the future only two staff strategies will survive. One set will survive by going as automatic (read self service) with lots of technological support. The other set will survive by upgrading training, seeking out real product/ service advocates and also supported with technology. The key question from the author that everyone trying to sell something should ask, When and where in the world are consumers when they are considering or in need of the things we sell. Figure that out and set your resource to take advantage of it. The consumer will gain more power. It is true marketers will be tracking them, but now the consumer can reverse the tables. With the power of the internet consumers will be able to make better choices of what they really want and marketers will have to adjust. The third shelf is a new concept that is already progressing. Consumers can scan Q codes with their smart phones, order products to be delivered conveniently. The author does not predict the demise of bricks and mortar stores as a big component of shopping is social. There are many examples of problems and solutions. The book is very engaging and thought provoking. Immigration is big news in the United States, but also in other "western" countries. There are those of us who "belong" and there are those "others." Some of the lesser noticed news is that immigration is decreasing in some quarters, but not enough to quell all of the very heated complaints. The most obvious concern for many is a threat to their job and as jobs are being automated and outsourced there is a race for what is left. Wages and perks are declining. Unfortunately (or it could be fortunately) society is becoming so efficient at making things that the job situation is very likely to decline everywhere. Immigrants aren't responsible so much as reacting to the fact that economic opportunities are shifting. Inside Canada and other countries the unemployed are being told to move to where the jobs are. Immigrants from foreign countries are in fact doing just that. The positive side is that immigrants increase demands for all sorts of products and services that in turn offer opportunities for domestic jobs. The job market started to boom when the "boomers" began demanding products and services and much of that demand has declined as the boomers age.. Immigrants also provide services that will be greatly needed as our population ages. Some of them provide skills we lack and others provide investment capital that can be put to good use and others are willing to do "dirty" work that the rest of us shun. At bottom we are most fearful that most immigrants are willing to work harder for less. In some areas there will be competition for immigrants. Some skills (or willingness to do dirty work) will be in short supply. How can we make it more attractive for immigrants? Money will be a major factor, but many immigrants are very concerned about their close relatives, education and cultural opportunities, community acceptance, legal protections. etc. Aside from jobs there is the whole idea that "they" are different and are replacing our culture that we hold dearly. Most immigrants do want to fit in and sooner or later they mostly do. Hockey is still the big deal for Canadians while Americans still get excited about football and baseball. We still have our Hollywood movies and Thanksgiving turkey. Many of us love our cottages and many of the rest of us (including many immigrants) envy them. Most immigrants want to fit in and do adapt, but thank goodness they don't forget everything they learned back home. Numbers and enthusiasm do make a difference and a lot of us established nationals have come to appreciate it. Going back before Europeans took over North America the real Native North Americans had a lot of quaint customs that we borrowed--maple syrup, snowshoes, canoes, corn on the cob and a philosophy that some of us revere such as conservation and respect for nature. They have adapted somewhat to our notions of property, work for pay, bureaucracy, language, etc. It is good that many immigrants take pride in many of their customs as some of us have found they add to our enjoyment of life. Food is one example as more North Americans eat a variety of ethnic foods such as pizza, Pad Thai, quinoa, samosas, burritos, etc. Music has been packaged in many different formats with immigrant contributions from all corners of the Globe. Soccer and basketball owe much to immigrants as do other sports. Cricket is providing enjoyment opportunities for native born as well as immigrants. This is only a small sampling of the countless contributions immigrants have added to our culture. Us natives have a certain way of looking at things, but are now wanting to deal with the rest of the world and we don't always understand the global marketplace. Immigrants bring a variety of perspectives that can not only shed light on our global opportunities, but also contribute to bettering our lives. How many can we take in without hurting our economy? There is a limit, but perhaps we should focus on how many we need to keep our economy going. We need to have people buy products and services that might otherwise result in red ink. We need people to carry on functions that are necessary, but difficult to get natives to do. How much can we absorb without changing more than we want? I think that will change with time as "we" won't be the same "we" we are today. I believe what will be retained is more than just what the majority values and that will include a variety of options. Not everyone will be as excited about hockey, but a few might be excited about soccer. Everyone will be able to find music and art that they love. There is more to life than what you were born into and discovering some of the new things will be to your benefit. Every change requires adjustments. Immigration does for all parties, but all parties stand to benefit. It is only a problem in some minds, it should be an opportunity for all. In this mid term election process there are knee-jerk "experts" ready to pounce on any statement they can stretch to prove a point. They are appalled by "no strategy," but really have little constructive to help make better decisions. Political posturing needs to be minimized, hopefully not using the Bush methods to silence dissenters. Colin Powell is said to have given an analogy to George Bush when informed the administration had decided an invasion of Iraq was imminent. As I understood it when you pick up a piece of pottery in a store and drop it you own it. Americans despite all their access to modern technology really had a very poor understanding of Iraq. Even so there was no real excuse to invade as there was no connection to 9-11 or proof of weapons of mass destruction. If they thought about it, Saddam Hussein had more to fear from Al Qaeda than Americans. Yes the rhetoric coming from Iraq was belligerent and all evidence points that Saddam was not very nice. The White House dismissed the UN inspectors and put their reliance on suspect sources and their own (political) guts. Instead of overwhelming the Iraquis, the administration brushed off suggestions of General Shenseki and failed to contain all the factions. They then showed their priorities very quickly doing what they could to protect oil interests, but ignoring almost everything else. As in any major civil disturbance there are criminal elements ready to take advantage, they let citizens fend for themselves. They decided that since the Baath party had been in control all members should be prohibited from government. They did not take into account that many members only joined for career survival reasons and that many of these people had vital knowledge and skills to offer a new governance. As is true in situations where a minority controls the majority there would be vengeance seekers and resentment from those losing power. Where there had been no Al Qaeda there was now a vacuum filled by jihadists from abroad, but who were able to recruit fighters from amongst dissatisfied members of the minority Sunnis, many of whom had military experience. In Iraq there were other minorities that played significant roles, mainly the Kurds, but also Turkmen, Christians and others. The Kurds have used the situation to leverage for more power and seemed to be most aligned to American interests. Part of their motive is gain their own separate state. This commendable aspiration is a big concern to neighboring powers such as Turkey, Iran and Syria who feel threatened by it. The Arab Spring caught a lot of us off guard, but some were quick to credit George Bush with helping to get it going. It has played out differently in the countries involved, but with some obvious benefits for democracy, but also with some outstanding concerns. Where it has caused the most confusion seems to be Syria where a civil war has erupted. Assad is another dictator abusing his country. He seemed up against the wall, but has fought back and in the process unleashed elements nobody seems to be able to control. The outcome of most concern seems to be ISIS which consists mainly of the most extreme fanatics who are able to use brutal tactics to conquer territory. Their brutality is frightening, but there is also a level of sophistication that might be more frightening. To be effective they had to have access to large amounts of financial support. At this point they are self financing through kidnappings for ransom and oil. They have started to "tax"some of their conquered people. It is possible their brutality will create enemies for them. I recall that the long ago English Civil War was started by those who frowned upon an arrogant monarchy. The Puritans that took over, not only executed a monarch but restricted activities such as card playing and dancing that eventually the people rebelled against. That seems to be happening in Syria and Iraq, but there are still those who think they use these brutal warriors for their own purposes. Sunnis feeling displaced want power back, religious conservatives want to see religious laws guide government. Assad, like many dictators likes to use the presence of a terrible alternative to justify his own power. ISIS has successfully conquered territory in two national states and trying to provide a government bureaucracy to control it all. They have tapped into a lot of resentment and brutalized their opponents. It seems they cannot be defeated without an international effort. The Americans of which Obama is a good example realized a major part of the problem was the Iraqui government controlled by Shiite factions created dissatisfaction amongst other factions weakening everyone. They have taken steps to correct that situation while trying to respect sovereignity. The big question seems to be can the Americans bomb ISIS in Syria without seeming to support Assad? Can they avoid more "boots on the ground"? Can they get more military support from countries that have a vested interest in the outcome and can that include Muslim nations? A pretty delicate situation requiring care and attention to details. A further complication is presented by Russia. Their agenda apparently includes restoring at least part of their empire starting in Ukraine. They have been allies of Syria and have tried to ameliorate some of Syria's excesses, for example regarding chemical weapons. They could possibly play a similar role, but they have other priorities. Russians having become a major energy exporter are asserting what they feel is their imperial right to enlargen their sphere of influence while most of their former empire is increasing ties with EU and NATO. It is not reasonable to expect co-operation. There are no good solutions and it must be acknowledged there are a wide variety of views on how best to handle the situation. A little bit of honesty should be appreciated as there is "no strategy" that will not cause harm to relatively innocent participants. A politically obstructive Congress" is a big part of the problem and should voters let themselves be influenced by political posturing with the November election the situation could become even more difficult. The decisions made by the previous administration will impact the world for at least a generation. We have opportunities to change direction in a more helpful way, but politics is making the difficult choices more difficult.